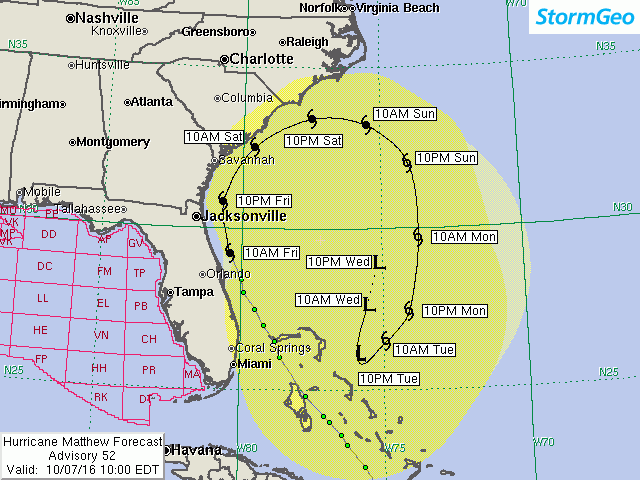 On Friday afternoon, Crowley’s Corporate Emergency Management Team continues to monitor Hurricane Matthew, which remains a major Category 3 hurricane. Hurricane Matthew made landfall between Daytona and Cape Canaveral and continues to track up the East Coast. Hurricane Matthew is the strongest hurricane to threaten the U.S. East Coast since 2007. Again, safety is Crowley’s number 1 core value. As such, we are taking all appropriate steps to ensure the safety of Crowley personnel, including our mariners, vessels and your cargo. Vessels are being directed to either remain in port or take routes that would steer them clear of the storm. At this time, we are experiencing disruptions with several of our services, including those involving Puerto Rico, Jamaica, the Dominican Republic, Haiti, Cuba, the Caribbean islands, Central America and the East Coast. Port Everglades is now open to vessel traffic and Crowley is beginning normal vessel operations at 15:00 today, Friday, October 07, 2016. The port of Jacksonville remains closed for inbound and outbound cargo. Our offices and warehouses in South Florida and Port Everglades are open and fully operational. Our Jacksonville, FL offices remain closed. Our customer support center will continue to be available during normal business hours 08:00-17:00 EDT. We will continue to monitor the trajectory of the storm and what impact it may have into next week on our services. We will update you with further information as it becomes available. We regret the circumstances surrounding Hurricane Matthew and are working to protect the integrity of your cargo and your supply chains. For the latest information on our sailing schedule, please visit Crowley.com .